Pamper The Skin You’re In! Guest Post | I am JuJu! Hi everyone! It has been an extremely busy February so far with homeschooling, travelling, working my It Works business, and keeping our home in order. I don’t know about you, but I could use a little bit (or a lot) of pampering! Today I am thrilled to have Michelle Pino of Skana Salon, a luxury spa in central New York, sharing some great tips on how to get that spa pampering in your own home, for a fraction of the cost! Michelle also enjoys cooking, fashion, and all things beauty related. With Valentines Day approaching, love is most likely in the forefront of your mind. For women, love comes naturally. We spend much of our time caring for children, friends, parents, siblings and co-workers. This Valentines Day, why not turn some of that love inward and give your skin a luxurious dose of affection with some special pampering? Often women use the excuse of being short on time and money as a reason for not indulging themselves with refreshing and rejuvenating beauty treatments. Setting time aside for a spa-like treatment isn’t always possible, but you can work nourishing beauty treatments into your regular routine without much effort. For beautiful, glowing skin it’s important to focus on hydrating your body from within as well as externally. Proper hydration does wonders for tired skin and helps vamp up any topical treatment by working from the inside to nourish your skin as well as your whole body. Drinking water should be your first priority for obtaining healthy skin. Not only will it improve the appearance of your skin, it will make you feel fabulous! Many women report the taste of plain water deters them from drinking enough. Why not try a fruit infusion instead? Simple to make and easy to drink, fruit infused water will quickly turn into one of your favorite pampering indulgences. It’s wonderful for your overall health as well as your skin! 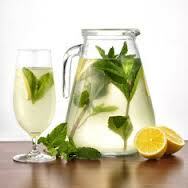 One favorite, especially during the cold months of winter, is a lemon mint infusion. Combine all of the above ingredients into a large container and allow them to steep for at least six hours. If you like a strong lemon flavor, put the squeezed rind into the container to steep with the rest of the ingredients. If you find the mint flavor too strong for your liking, you can reduce the amount used. If you prefer it stronger, add a bit more to taste. You can strain this mixture with a fine mesh strainer to catch any seeds and mint leaves. This infusion is most refreshing when served chilled over ice. Healthy skin also needs some pampering on the outside with regular exfoliation. Removing the dead, tired cells from the surface of your skin will reveal the healthy, glowing skin underneath. Using a simple, homemade body scrub will rejuvenate your skin without breaking your wallet. Try using extra virgin coconut oil combined with raw sugar. Mix one part oil to two parts sugar. While the coconut oil smells divine on its own, you can also add a drop or two of an aromatic essential oil to boost the pampering factor. Rose oil, jasmine and lavender are all wonderful choices, but remember: a little goes a long way. Mix your oil, sugar and fragrance together in small bowl with a wooden spoon. Scoop the mixture with your hands and start rubbing it first into your driest areas. Using small circular motions, gently scrub your entire body and then rinse off with a warm shower. Your new skin will be glowing, healthy and ready to enjoy the best Valentines Day ever! Thank you so much to Michelle for sharing ways that we can take great care of our skin! I’ve been looking for some great infused water recipes and the lemon and mint recipe that Michelle shared is one of the easiest I have seen!! I’d love to hear what you do to pamper yourself! Here’s to a great year (and beyond) of taking care of ourselves! This entry was tagged diy pampering, infused water, lemon mint infused water, pamper the skin you're in, pampering on a dime. Bookmark the permalink.